Zuri brings to you 10 beautiful nail art designs inspired by Indian motifs such as elephants, peacock feathers and a lot more! Many nail art buffs are looking for the perfect nail art design to sport on traditional Indian occasions. You want something that looks stylish and interesting, but at the same time gels perfectly with your lehenga or sari. Choose from our collection of nail art designs inspired by Indian motifs to create the perfect complement for your Indian outfit. Lets begin with the colors. Although it may seem like the reds and pinks are the only option, there are a lot of other colors that you can pick from. Go for a coat of white nail polish and add golden embellishments or stickers with Indian motifs. Something abstract, like the kind of design you would see in an Indo-Arabic mehendi is a good choice. If you do opt for reds or pinks, try to create a gradient effect that goes from a shade of pink to a deep, sultry red. Pick a simple mango based Indian sticker in gold and replicate it across your nails. Going through the process of creating nail art for all your nails can get tedious, especially if you want to go for Indian motifs. 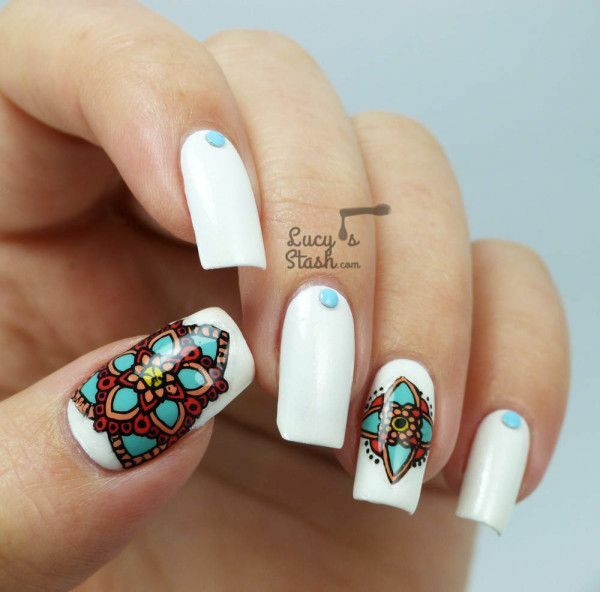 Easy but simply gorgeous way out is to create an elaborate Indian motifs on a chosen few nails. Try the blossoming flower design which reminds me of colorful rangoli in Diwali. Make this pattern only on your ring fingers and leave the others bare and white. Another shortcut is to do up only the tips of your nails. Use a stencil diagonally across the tips of your nails to create the effect of a special Indian themed nail, quickly and easily. Use a bright color in as the base coat, as the nail art is minimal. Nothing is more Indian than elephants and peacocks. These animals are synonymous not only with India, but also with Indian art. Finding stickers or stencils in these shapes is also not very difficult. Go for a light, pastel base coat and fill in your elephant stickers with a dark nail polish. Drawing a peacock across your nails may seem like a lot of effort, but the effect is so glamorous and different that it’s totally worth it. Even one feather of the peacock is a wonderful choice for your Indian outfit. Do up the rest of your nails in shades of a serene blue and add highlights of gold to your feather as the final touch. Nail art with dark base colors may seem like a challenge when it comes to Indian motifs. But all you need is a a good, bright gold nail color to create your nail are with. Go for bolder patterns or simply use stickers at the base or tips of your nails. This will help you create a look that stands out from everyone else. Moreover, it will be simple enough to go with multiple outfits – which might be necessary if you want one look for a wedding and sangeet. Judge your nail art design on the basis of your outfit. Indian outfits tend to be loud and bling in festive and wedding seasons as it is. Tame and cut down on your nail art if required so that the overall effect is pleasant and works together seamlessly.